Ancestors on both sides of the family came from England about 200 years before Judson’s birth and settled in Massachusetts. Father Stephen Bemis was born in Westminster, Massachusetts on March 20, 1804. When he was sixteen years old he was apprenticed to a chair maker. Mother Mariam Thurston Farwell was a descendant of Henry Farwell who came from England to Concord, Massachusetts in the 1630’s. Stephan and Mariam were hard-working, God-fearing people and in their early years were members of the Fitchburg Congregational Church but resigned their membership and became Baptists. They were greatly influenced in this decision by Reverend Adoniram Judson. Stephen and Mariam formed the First Baptist Church of Fitchburg in 1831. When their third child was born they named him after Rev. Judson and a local Baptist preacher. Judson Moss had a brother Stephan Allen and a sister Mary Hepsey. Shortly after Judson’s birth, the family moved to Big Flats, New York where Mariam’s brother Henry Farwell and his family lived. They lived there until the summer of 1838 when the two families moved to the then frontier state in the Far West–Illinois. They traveled in three covered wagons on a journey of 800 miles. They settled in the Rock River country where earlier Henry Farwell had purchased land. This was a difficult life, especially for women. Mariam died when Judson was six years old. A few months later, Stephan married a widow named Mary Neville who had one son about the age of Judson. During the following years six children were born to Stephan and his wife. Stephan farmed and made chairs for a living until gold was discovered in California. He joined an expedition to search for gold. After three years wasted in this fruitless quest he returned home content to till the soil and make chairs. During this time Judson found work with his uncle and attended Mount Morris Academy, a Methodist school. Judson’s cousins and his brother worked in Chicago. When his brother Stephan yielded to an attack of gold fever, Judson at nineteen years of age was offered the position he was giving up–office boy and clerk for the firm of Thomas W. Hale and Company, agents for a steamboat line. After a year Judson had nothing to show for his efforts except experience and a fifty-dollar gold piece which his employer gave him for Christmas. Convinced that Chicago property was a sound investment he persuaded his uncle to join him in buying a property on North Clark Street for $800 which was acquired on “canal terms”, a quarter in cash and the remainder in three equal installments with interest at 8%. Before the second payment was due they sold the lot at a profit of $400. The following year he bought another lot which he later sold for a profit. From these small beginnings there later followed real estate transactions of considerable magnitude. After six and one half years with Thomas Hale and Company and about $2000 in hand, Judson looked to start a business of his own. Judson’s cousin Simeon Farwell had developed a small bag factory in Chicago, one of only three or four in the country. He agreed to contribute some of his machinery in a venture with Judson in St. Louis. Under the terms of the partnership, Farwell was to have one-third share in the enterprise and Bemis two-thirds. Thus, in 1858 J. M. Bemis and Company, Bag Manufacturers was born. Judson’s cousin, Edward J. Brown became a partner in the company whose name was later changed to Bemis and Brown. This company expanded by acquiring other companies including a mill to make cotton sheetings for their bag factory. In 1861 business felt the effects of the coming war. Bemis and Brown experience an enlargement of trade and the bag factory became very busy. A Boston office was opened and at the end of the war Judson left the St. Louis office in the hands of Henry Digby and moved to Boston. Judson and Alice Cogswell were married in Cambridge, Massachusetts on November 21, 1866. The next thirty years were busy ones for Judson. His company expanded and grew. His brother Stephan came into the business and Judson’s attention turned to cotton. The Bemis Brothers Bag Company opened factories in Minneapolis, Omaha, New Orleans, San Francisco and Indianapolis. The trademark of the company, a cat looking out of a bag, became synonymous with honest and reliable quality wherever bags were used. Judson and Alice became the parents of two sons, Judson Cogswell Bemis and Albert Farwell Bemis. In 1882 the family moved to Colorado Springs, Colorado because of Alice’s health problems. Judson spent most of the time in Boston because of business responsibilities. After spending a year with his mother in Colorado, Judson Cogswell was sent to a manual training school in St. Louis. In his second year of school, Judson Cogswell was taken ill with pneumonia and died on May 10, 1885. Another step in making the Bemis Brothers Bag Company self-contained and self-dependent was taken in 1900 at the urging and planning of Albert Farwell Bemis. To be close to the source of raw material (cotton), a cotton mill was built and began operation three miles from Jackson, Tennessee. 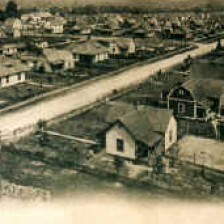 Madison County donated the necessary land, the company built homes for the workers and the town of Bemis, Tennessee came into existence. Quote (page 298) “The most interested undertaking of the company founded by Judson Moss Bemis is the pleasant town of Bemis, in Madison County, Tennessee, on the main line of the Illinois Central Railroad, three miles from Jackson, a thriving city of twenty thousand inhabitants. The cotton mill, which was build in 1900, has since been greatly enlarged and the town, founded at the same time, has grown until its population now exceeds two thousand people. Mr. Bemis took a very deep interest in the town named after him, the development of which his son planned. Much time, though and money were given to making it an ideal manufacturing community. Its street are wide, well-paved, and lined with shade trees, water is supplied in purity and abundance from artesian wells and piped to all the houses. Electric lighting and a modern sewerage system are provided. The company has built many attractive small houses on ample lots, which allow room for individual gardens and playgrounds. There are no ugly tenements and the houses are let to employees at a very low rental. There is a large pond for aquatic exercises and not too remote are the woods, meadows, and streams of Tennessee for the hunter and fisherman. Bemis a a home town, built for its own people around the mill, which gives its men and women steady employment at good wages under ideal working conditions. The plant is exceptionally equipped in details of light, space and air. It is kept scrupulously clean and provided with every known appliance for safety and sanitation. A modern store, the Bemis Mercantile Company, is conducted for the benefit of the employees and their families, supplying them with groceries and general merchandise at low prices. Besides the house, the company has erected several public buildings for the use of the citizens. Mr. Bemis and the company jointly provided a handsome Y.M.C.A. building, the finest in that section of the country, having educational departments, a reading room, library, dining room, billiard room, classrooms, and a well-equipped gymnasium with shower stalls and barber shop. Three public schools were built and presented to the town by the company and are conducted by the Board of Education of Madison County. Among other buildings given to the town by the company is a fine auditorium, an unusually handsome and effective structure. The Bemis Union Church was presented by Mr. Bemis, who in 1906 also put aside fifty thousand dollars in preferred stock of the company as a trust fund, to continue in force for twenty years, the income from which is divided between the church, its Sunday school and the day school. The increase in population resultant from the enlargement of the mill necessitated an addition to the church. At its dedication on April 19, 1908, Mr. Bemis was present and delivered an address to the mill operatives, in the course of which he set forth his attitude on industrial relations and outlined what he hoped would be accomplished at Bemis. Among other things he said: “We believe capital and labor are gradually working toward a more complete understanding for the mutual benefit of both. Anyway, we will try to solve this world-wide question right here in Bemis, as it affects you, the operatives, and us, the proprietors, in working hand in hand for the benefit of both. On our part we are trying to give you clean, healthy homes to live in, and a clean, healthy factory to work in. Now, on your part, the operatives should give the proprietors the maximum service possible for the maximum or largest wages that we can afford to pay. I have told you before that we ventured our capital here to make money. So we did, and we are still aiming at that result, because if we fail to accumulate we cannot disburse. If we do not make money, we cannot spend it. We cannot give you nice home, a healthy place to work, a school for your children, and a church to worship in, unless our income is more than our outgo. Our income or profit depends on our operatives and our joint work. We are interdependent; in other words, mutually dependent. If our action in the past does not tell you what we do with a large portion of our income, then no words of mine can tell you. Our actions speak for themselves and are louder than words. What we will do in the future depends largely on you. We will say, however, that we intend, barring accidents, to make Bemis the finest manufacturing town in all its appointments in this state. Now naturally we like to have the favorable opinion of our operatives, and taking all of our bag factories, about a dozen, we think we have treated the operatives fairly well. Commencing with one factory fifty years ago and now running a dozen, we have had but two small strikes. Therefore we leave you to say if we are treating you here in Bemis well or not. If so, it tells you we are treating our operatives well in other factories. “It is with great sorrow that we record the passing away of Mr. Judson Moss Bemis, the founder of the Bemis Brother Bag Company, of which he was the honored president and guiding sprit for more than fifty years and the one whose vision made possible the village of Bemis, Tennessee, which bears his name. Erected in our hearts are memorials of his noble spirit, his generosity and his constant thought for the uplift and welfare of his people. His simplicity of character, his genuineness, his strict business integrity and his sympathetic understanding won the respect and confidence of his thousands of employees. In our village are material proofs of his keen interest in the welfare of others; the church, the schools, the Y.M.C.A., the pleasant homes, all testify to his practical generosity. These resolutions were signed by a committee consisting of both men and women and representing the entire population of the town. I had the privilege of being born and raised in Bemis, TN. My father, grandfathers, aunts, uncles, cousins worked for Mr. Bemis starting around 1915 until 1977, most of them working for at least 20 years. I was very sorry to see the Mill sold and life as I knew it growing up come to an end. Appreciate your kind words about Mr. Bemis and the industry and community he created.